Jay-Z is helping to open our eyes to the radically unjust system we’re all dealing with when it comes to the war on drugs. It’s not every day we see celebrities step forward and discuss their views on controversial topics. One man we can always count on to voice his opinion is Jay-Z. He’s created a short film, with the help of artist Molly Crabapple, to showcase the history of the war on drugs that our nation is still trying to fight. While he makes it clear the battle is an epic fail, his facts are on point and leave little room for argument. Check it out below. Jay-Z was contacted by the same woman who helped co-author his book, “Decoded,” Dream Hampton. This filmmaker approached the Drug Policy Alliance with the idea to make a short film that would open people’s eyes to the radically unjust systems around them. Hampton wanted to do a collaboration involving Revolve Impact, an organization that helps connect social influencers and artists to propel important messages. The idea behind the video is to force the general public to witness the racism surrounding the marijuana legalization movement. The film is a sort of history lesson on the drug war and the groups that are most affected by the outlandish laws. While African Americans are still being arrested at alarming rates, Caucasians are doing the exact same activities, but getting rich in the process. 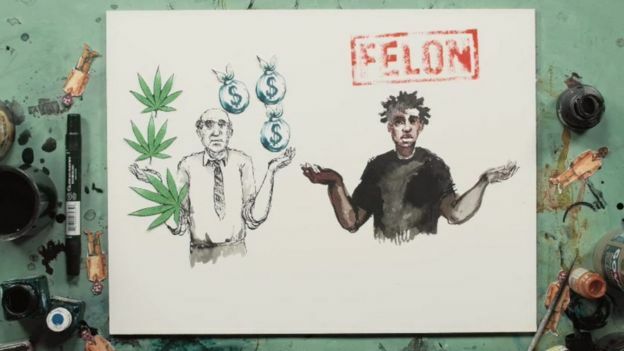 One of the main points of the video is the idea that African Americans make up the greatest number of individuals suffering from the unjust laws surrounding the drug war. While African Americans make up just 13% of the United States population, 31% are arrested for infringing on the drug laws; an astounding ratio that far surpasses any other ethnicity’s rate of incarceration. While dealing with such a controversial topic, Jay-Z holds nothing back when it comes to expressing his point of view, which he backs up with facts and statistics that can’t be argued with. The filmmakers are hoping this film will help voters to understand the importance of the upcoming cannabis legalization vote in California. Once the law is passed, people with low-level cannabis crimes will be released from jail, helping to right a wrong that has been decades in the making. Do you believe Jay-Z offers valid points for legalization in his film? Share with us on Facebook, Twitter or in the comment section below.